The library's architecture collection has a long tradition entwined with the development of technical and engineering education in Central Europe, providing specialized information resources in architecture and design to students, teachers, and technical specialists. It contains a wide range of publication types ranging from classical works beginning with I Quattro primi libri di Architettura / di Pietro Cataneo Senese in 1554 to the newest eletronic resources (ebrary, ProQuest, and others). Ebrary digital library contains online books about architecture. The library’s old books and special collection contains classical works by Vitruvius, Alberti, Palladio, Vignola, Semper, Sitte, and others beginning with I Quattro primi libri di Architettura / di Pietro Cataneo Senese (1554) to 1920. The old books and special collection has a long tradition entwined with the development of technical and engineering education in Central Europe. The large majority of its contents are in German or French, since the German language was historically and geographically closest to the Czech lands, with a high percentage of scientific works translated into German from their original languages (Latin, English, Italian, or Czech). ProQuest provides access to a large collection of full-texts in science, technology, and medicine (STM). Taylor & Francis is one of the world's leading publishers focusing on scientific literature. The library's subscription includes the collection Science & Technology Library where you can find more than 500 peer-reviewed academic journals. Current volumes of print journals in architecture are located in the Periodicals Reading Room on the third floor, shelves 3D025-3D036. With more than 20,000 words and terms individually defined, the Dictionary offers huge coverage for anyone studying or working in architecture, construction or any of the built environment fields. The innovative and detailed cross-referencing system allows readers to track down elusive definitions from general subject headings. Starting from only the vaguest idea of the word required, a reader can quickly track down precisely the term they are looking for. Beautifully illustrated and written in a clear and concise style, this dictionary covers every period of Western architectural history. The text is complemented by over 250 beautiful and meticulous line drawings, labelled cross-sections, and diagrams. There are more than 900 new entries, including hundreds of new biographical entries on leading historical architects, as well as subjects such as algorithmic design, digital architecture, and parametric design, and many entries expanding the coverage of landscape architecture. Places Journal is an essential and trusted resource on the future of architecture, landscape, and urbanism. We harness the power of public scholarship to promote equitable cities and resilient landscapes. In these pages you will find writers, designers, and artists who are responding to the profound challenges of our time: environmental health and social inequity, climate change, resource scarcity, human migration, rapid technological innovation, and the erosion of the public sphere. JAE is biannual peer-reviewed academic journal published by Routledge on behalf of the Association of Collegiate Schools of Architecture. The JAE has been the primary venue for research and commentary on architectural education since it was founded in 1947, making it the oldest continuing operating journal of its kind. OASE is an independent, international, peer-reviewed journal for architecture that brings together academic discourse and the sensibilities of design practice. OASE advocates critical reflection in which the architectural project occupies a central position, yet is understood to be embedded in a wider cultural field. Published two times a year, each OASE provides a rigorous investigation of a specific theme, featuring architecture, urban design and landscape design and insisting on the discussion of the historical and theoretical aspects of contemporary issues. Architectural Histories is the international, blind peer-reviewed scholarly journal of the EAHN that creates a space where historically grounded research into all aspects of architecture and the built environment can be made public, consulted, and discussed. 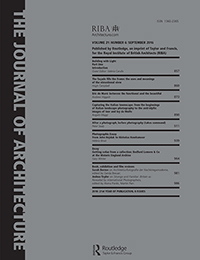 The journal is open to historical, historiographic, theoretical, and critical contributions that engage with architecture and the built environment from a historical perspective. Architecture - Provided by The Royal Institute of British Architects (RIBA). Architecture.com has been designed to beautifully showcase architecture and the enormous impact that buildings and our environment have on people, communities, and culture worldwide. The website combines expansive full-width photography and magazine-style layouts to deliver stories. The Architecture - An architect’s resource, including the latest competitions, awards, and job opportunities. Join over three million visitors, browse by category, or subscribe to an RSS feed to keep up-to-date. Accustudio - AccuStudio is the source for AccuRender, and includes related news, support, events, and ever-growing numbers of resources. Supports AutoCAD, Revit, Rhino, and SketchUp. Getty ULAN online - The Union List of Artist Names ® (ULAN), the Getty Thesaurus of Geographic Names ® (TGN), the Art & Architecture Thesaurus ® (AAT), and the Cultural Objects Name Authority ® (CONA, in development) are structured vocabularies that can be used to improve access to information about art, architecture, and material culture. In these TED Talks, master architects share their vision for inspired buildings. Hear from Frank Gehry, Norman Foster, Liz Diller, Daniel Libeskind, Moshe Safdie, Thom Mayne, Thomas Heatherwick, Bjarke Ingells, David Rockwell and more.